Lemon Water - Is It Good For You? Even though lemons are the smallest of the citrus fruit family, they contain more healthy nutrients than other citrus such as oranges, tangerines, grapefruits etc. Lemons are the most popular citrus fruit in the world and have been used in recipes for centuries. The most common recipe for lemons is lemon water, which is simply lemon juice squeezed into a glass of cold water. Very refreshing on a hot day! Lemons are thought to have originated in the foothills of North-East India in the Himalayan district, but have spread through the Middle East, Africa, Americas, Pacific, and Europe to become the most widespread and prolific citrus tree in the world today. The lemon tree itself grows to approximately 2-3 metres in orchards and plantations and prefers a temperate to tropical location. It is generally a hardly tree which only requires a moderate amount of water. Cold and frosty conditions tend to stunt their growth and ability to produce good quality large fruit. Some lemon trees are known to have strong sharp thorns adorning their branches so beware when picking the fruit of the lemon tree. A mature fruit will generally measure between 5 - 8 cms and weigh approximately 50 - 80 grams. The health benefits of lemons are nothing short of remarkable! They are packed full of nutrients and are low in calories and do not contain any saturated fats or cholesterol. They are rich in dietary fibre and citric acid which aids digestion, and have been scientifically proven to help dissolve kidney stones. Lemons are also a great source of ascorbic acid (Vitamin C) which is known to be a natural anti-oxidant. It also helps to prevent scurvy, a disease which plagued many ocean-going voyages around the world during the life and times of Captain James Cook. Vitamin C also helps the body to resist infectious agents and helps with eradicating harmful free radicals from the blood. Lemons also contain a variety of phytochemicals which also assist this process. Vitamin A is present in small levels together with flavonoids such as B-carotenes, beta-cryptoxanthin, zea-xanthin and lutein compounds which all have antioxidant properties. Vitamin A is essential for good vision, healthy skin and mucus membranes. Consuming lemons which are rich in flavonoids, are known to help protect the body from lung and oral cancers. Vitamin B-complex such as panthothenic acid, pyridoxine and folates are present in good quantities in lemons, which allows our bodies to replenish its supplies. Minerals such as iron, potassium, copper and calcium are also present in lemons. Potassium is a significant element that helps control a good heart rate and blood pressure. As science discovers more and more about the health benefits of lemons, we are now aware that the ingredients and dietary fibre of lemons are helpful in reducing the risk of cancer, arthritis, coronary heart disease and obesity to name but a few. 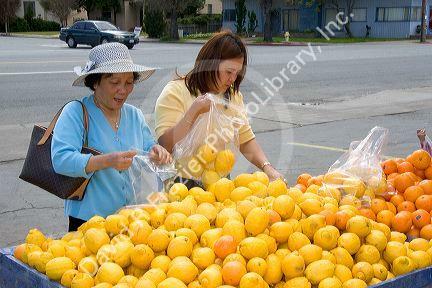 When purchasing lemons be sure that they are a rich bright yellow colour and send out a fresh citrus fragrance as you rub your fingers gently over the skin. Dark green lemons are not ripe and should be avoided, as should soft and spongy lemons as they will be old and past their best. Lemons can be stored easily at home in the refrigerator for around a week. Fresh is always best to get the most nutrients from the fruit. The easiest and most nutritious way to consume lemons is straight from the tree made up into a refreshing glass of lemon water. Be careful in your consumption of lemons as they have a very low PH reading of approximately 2.0. The sour taste from lemons can cause a burning feeling in and around the mouth and if lemons are consumed in large quantities it may lead to stomach ulcers being formed and the occurrence of acid-peptic disease. The above details are offered as general advice only and should not be relied upon as exclusively accurate, nor as your only source of dietary information for lemons. I encourage you to do further research on the health benefits of lemons as this account, although comprehensive, is by no means exhaustive.